There are so many exciting places to visit when you take a private jet charter to New Orleans with JetOptions. The area has so much history and culture and is known for being full of life and color. There are so many distinct neighborhoods to explore, and so much to do. When you take a private jet charter to New Orleans, you find that there’s no other city in the world quite like it. New Orleans is a place you must visit once in your life, so make the best of your adventure in the Big Easy. When you fly by private jet you can go beyond the commercial airports in New Orleans. Private planes can select the Louis Armstrong Airport / MSY to fly into or depart from. With the longest runway in the area at 10,104 feet, there are two fixed base operators (FBOs) at KMSY meeting the passenger, fueling, and service needs for private aircraft. The primary private and general aviation airport is New Orleans historic Lakefront Airport / NEW. With one long runway of 6,879 feet for larger jets, there are two smaller runways of 3000+ feet for smaller aircraft and single engine airplanes. There are two fixed base operators at KNEW, 24 hours of operation, passenger terminals, jet refueling, hangars, maintenance and service. Ground transportation is available with rental cars, town cars, and limousine service available. The airport of choice for travel during Mardi Gras, Lakefront Airport was originally built in the 1930s, and the terminal building has many of the original interior decorative features alongside the classic Art Deco architecture. Take a private jet charter to New Orleans and visit the famous French Quarter. Divided into two parts, you’ll find the upper Quarter which is busier and has a lot of tourists. The lower Quarter is closer to the Marigny district and is relatively quieter than the upper Quarter; it’s also a great place to rub shoulders with the locals. For a four-star stay, visit the Hotel Monteleone on the upper side, where you’ll soak up the historic charm and luxury, and can enjoy features like the revolving Carousel Bar. The Carousel Bar and Lounge overlooks Royal Street in the heart of the French Quarter, all framed by beautiful fan windows. The area boasts estate jewelry sales, arts, and antiquities. Also on the upper east side are boutique shops and 18th-century French Colonial cottages. When you go to the French Quarter with a private jet charter to New Orleans, go to the French Quarter Festival. With more than a dozen stages entertaining audiences for free for the three-day weekend. Some music genres are featured at the festival, such as traditional, contemporary jazz, Latin, rhythm and blues, Cajun and zydeco, New Orleans funk, classical, swing, rock, and international sounds. More than 100 performers can be seen at the festival. 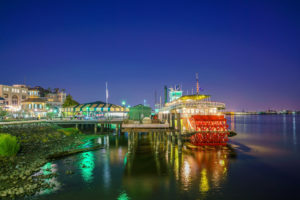 More, the world’s largest jazz brunch is held at the Woldenberg Riverfront Park and in the French Quarter including hurricanes, jambalaya, blackened catfish po-boys, crawfish and Cajun pies. There are more than 60 food and beverage booths with all dishes priced from $3-$5. The French Quarter Festival also gives free tours of hidden patios and gardens of local homes, the Pirate’s Alley art show and fireworks on the Mississippi River. Take a private jet charter to New Orleans to go to the New Orleans Jazz Heritage Festival also known as the Jazz Fest. This festival celebrates the rich culture of New Orleans and Louisiana with tons of music, delicious delicacies and featuring arts and crafts. Fly a private jet air charter in New Orleans with JetOptions. Call Us for a custom quote, or email our Charter Team today!